I was walking around booths at the Book Expo when I popped into a particular booth and spied this book. The Contest grabbed my attention instantly because of the cover art (i.e., girl in straw hat with red braids.) Figuring this would lead to something interesting, I flipped the book over and read the description, which included numerous references to Anne of Green Gables. Given my love of Anne of Green Gables, I figured it would be a safe bet that I would either love and adore The Contest or hate it with a violent passion. I'm pleased to tell you that I ended up going with the former attitude towards the book. I rather enjoyed it. This book tells the story of Rosy, who is half-Mohawk, and who loves Anne of Green Gables. Her father left her mother when she was expecting Rosy and to make ends meet, her mother works constantly in order to put food on the table and keep a roof over the family's head. Rosy loves Anne, but cannot afford to purchase a set of the books for herself, so she has to content herself with checking them out (continually) from the library. When she hears that there is to be an Anne of Green Gables Look-Alike Contest and the winner is to be the recipient of a set of the Anne books, Rosy knows she must enter and win this prize! The "problem" is that she doesn't exactly look like Anne. Her only hope is in the talent section, where she knows she can recite Anne passionately and by heart and win the judges over. 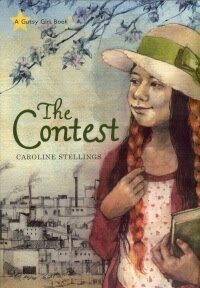 ** When she goes to a meeting to learn more about the contest, she meets another young girl named Lydia Parker. Rosy's heart sinks upon meeting Lydia because Lydia bears a striking resemblance to Montgomery's Anne. Rosy also finds it hard to be friends with Lydia, as the Parkers are very wealthy. However, for all of their monetary wealth, they lack love and family community. Lydia Parker is not entering the contest to win the books, but to win the attention of a neglectful father. Although there are themes in here that I find a little tough to swallow, I have nothing but praise for this book. Yes, there are stories of broken families and strained friendships. However, I felt that author Caroline Stellings summarized the moral of her story well by concluding that Anne didn't care about wealth, prestige or position. She merely wanted to be loved and to belong to someone. Stellings hit the nail on the head both with Montgomery's Anne and with this book. I really enjoyed this story and am glad to have had the opportunity of reading it. Thanks, Orca Book Publishers, for the chance! ** Side note about myself. A few years back there was a local production of Anne of Green Gables and I went in for auditions - strictly for the fun of it. I had my turn at a reading and the producer of the play asked me to read part after part. She and I both knew that I wasn't a good fit, age or appearance-wise, for any of the parts but she kept having me read. At the end of my "audition" she told me I was "quite an actress!" I laughed hysterically (internally.) For the record, I am a HORRIBLE actress. I've just happened to have read the Anne books a kazillion times and seen the movie more times that I can count. I KNOW the books. I know how they read. So I very much identified with Rosy's passion for Anne and I admire her for it! Thanks for this review, Carrie! As a side note, it's hard for me to watch amateur productions of GG (or perhaps professional ones, too) because to me they all sound like they're copying the movies! The cover reminded me of Anne right off, too. Sounds like a sweet story.